Submitted by eleutheros on June 24, 2015 – 9:44am. Hello! I’m new here, but I’ve been reading TFL for months as I learn how to make good (and fix not-as-good) sourdough. 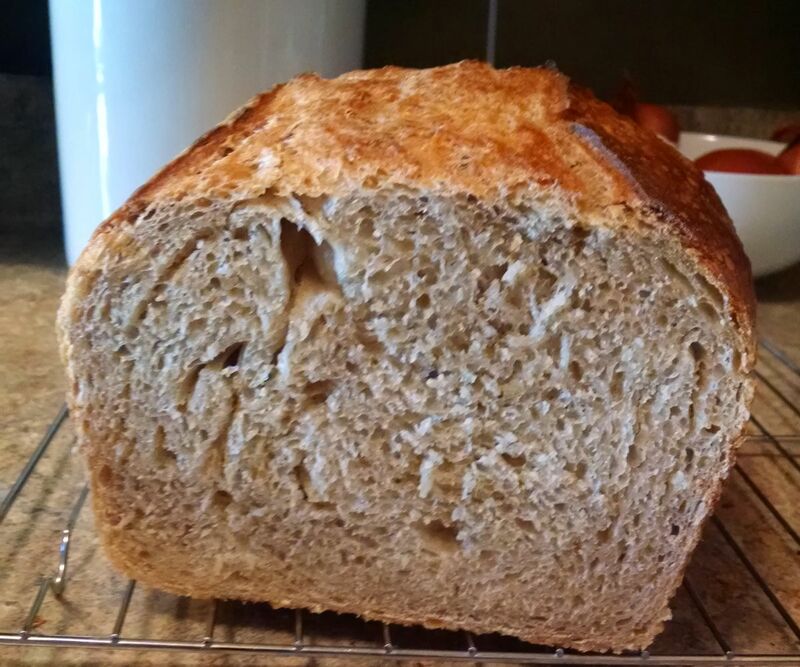 I’ve been tinkering with everyday wheat breads for a while, and have something that works reliably now. As an old Free Software hand, I know that the best way to get better from here is to give back to the community. My mother culture is a 100% hydration white, fed on organic unbleached AP because that was what the wee beasties seemed to like best. I keep a big jar of it in the fridge, feed it a bit less than once a week, and refresh it a bit less than once a month. (I used to feed it with the leftovers of my active starter for baking, but with this recipe I now only make exactly as much as the recipe needs.) I like a fuller, rounder “sour” flavor, so I tend to keep a fair amount of what Forkish calls “spent fuel” in my big jar. Now, that hasn’t been perfectly true, because I sometimes need between 2–4% extra flour at the end, when I’m kneading. On the other hand, in the winter I would sometimes have extra flour left over, so it may just be a temperature and humidity issue. On the other other hand, this is all the flour in the entire recipe, including what goes on the kneading and shaping surfaces, and I don’t see that accounted in many recipes, so I don’t feel that bad about occasionally having more than 100% total flour in the recipe. Bread is a living thing, and YMMV. There are two of us at home, so I make an 8x version of this recipe (by gram weight) about once or twice a week. It winds up being about 3 lbs when it goes into the oven, and loses about 5 oz while baking. 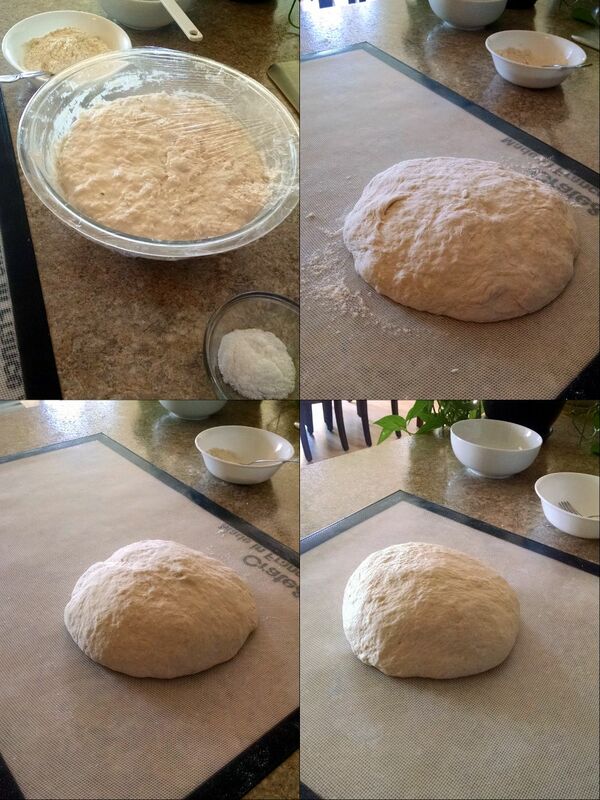 Step 4 is where I shift from AP-with-a-little-whole-wheat to bread-flour-with-a-little-AP, and start building the dough. After incorporating that flour and water, I generally let the ragged mass autolyse for half an hour, sometimes more, before adding the salt and turning it out onto my floured silpat for kneading (step 5). The rest of the flour (plus maybe 2–4% extra depending on humidity) gets incorporated gradually through kneading. I do three 5-minute kneads, with 10-minute rests in between, and every time I return to the dough it’s clear the rest has been beneficial. Each rest is like another little autolyse, which is good since more flour keeps going in. (Besides, it also gives time to do the washing up!) At the end, the mass goes into a large oiled bowl (the biggest I have), and gets about 4 hours bulk fermentation at room temperature. I have to punch it down in this warm weather, because after 2 hours it has usually filled the bowl, so I’ve taken to doing stretch-and-fold in the bowl and inverting the mass each time, rather than preshaping after fermentation is done. Since the stretch-and-fold in the bowl has given me a relatively well-shaped mass already, I just turn the mass out onto my silpat for final shaping, and pop it in my buttered 9×5 loaf pan. (It’ll do a freeform loaf just fine, whether boule or batard, but for even slices the loaf pan is better—and the buttery crust is delicious!) Since I have two loaf pans, I just invert the clean one over the top to keep the moisture in and give room to rise. There’s no way in this weather for me to get a properly-proofed loaf at room temperature, so this contraption goes into the fridge for a few hours before slashing and spritzing the loaf for baking. The crust I’ve managed to get right basically from day 1, with my 12″ cast iron pan on the bottom rack, the oven at 430 dF, and a combination of spritzing the loaf and pouring a cup of hot water into the pan for steam. It could go darker, at a higher temperature, but I’m content with the dark amber color I’m getting, and about 45 minutes bake time. 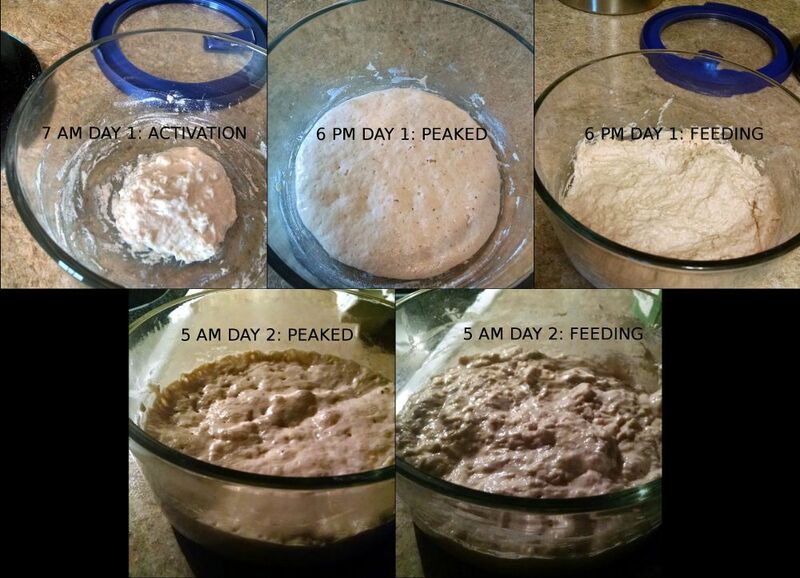 « starter / yeast: are they alternatives ?